Learning a few bejeweled Blitz cheats and tips for Facebook help to rack up points quickly in this fast-paced, addictive Facebook game. Learning how to master the game will keep you at the top of the tournament scoring list! Bejeweled Blitz is based on the classic Bejeweled game, in which you match multi-colored jewels with those adjacent to them in order to remove them from the board. If you can make a line of three or more identical jewels, they pop off the board and new ones will fall from the top. In classic Bejeweled, you can play a timed game, or play a leisurely game that continues until you run out of possible matches. Bejeweled Blitz, a popular Facebook application developed by Pop Cap, is the complete opposite of leisurely. You have exactly one minute to clear as many jewels as you can, while racking up as many points as possible. If you've been playing this game, you may have already wondered if there were any Bejeweled Blitz cheats and tips for Facebook. Once you get started, it's quickly apparent that tips would come in handy! Here are a few ways to maximize your score in the game. 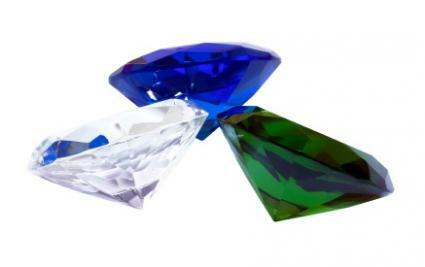 There are five "boosts" available in Bejeweled Blitz, and they can be purchased with coins you can earn during each game. While you're playing, pay special attention to the yellow jewels with the "100" label on them. Removing these earns you 100 bonus coins. Mystery Gem - The mystery gem places a random special gem at the beginning of the game. These can be used to blast open large spaces or entire rows of jewels. Detonators - Detonators, when used, set off all of the special gems that are currently on the board. Reshuffle - The reshuffle button can be used twice per game. When you click on it, the entire board is reshuffled. Five Extra Seconds - This boost adds five seconds to your game. Multiplier - A multiplier is added to your game board right at the start, giving you more time to blast open successive multipliers and increase your score. You can purchase up to three boosts at a time, and each one lasts for three games. At the end of your game, when the time runs out, you'll get a Last Hurrah. This bonus explodes all of the special gems on the board, giving you the points for them even if you didn't have time to use them. One way to maximize the Last Hurrah is to leave a few special gems on the board when time runs out, just to gain some extra points after the crazy action has stopped. To mix up the board, make combinations at the bottom of the screen so more gems will be shuffled down. Always be on the lookout for opportunities to create power gems, and use them often. Be sure to target the multiplier jewels, as these will drastically increase your score as you progress. If you get stuck, look near the top of the board for matches. The game is set up so that it will never run out of possible matches, so many will appear with the new gems coming down from the top. Don't be afraid to use the Hint button if you're really stuck. It doesn't cost you anything, and it's better to get a hint than to stare blindly at the screen. Start clicking and moving gems right away, even before you're told to start. You can also keep swapping when you get speed bonuses, and even while jewels are falling. If you can slip a jewel into an upcoming line you can get a sneaky booster gem. Once you start swapping, keep moving your eyes around the board, looking for your next move. You can swap jewels by clicking on one first, then the next. To hasten this process, simply click on the first jewel and slide your cursor slightly in the direction you want to swap. Once you've made a swap, immediately move on to the next - don't stop to wait for the lines to burst. You'll collect bonus points for speed with each one, and as you go faster, multipliers and special point opportunities will arise. Bejeweled Blitz is an addictive Facebook application, and it's a game that moves quickly. Practicing is easy, since you're always earning coins and each game lasts only one minute. Keep playing and watch as you climb the leader board of your friends!